Dimensions: 8″ x 7″ dia. 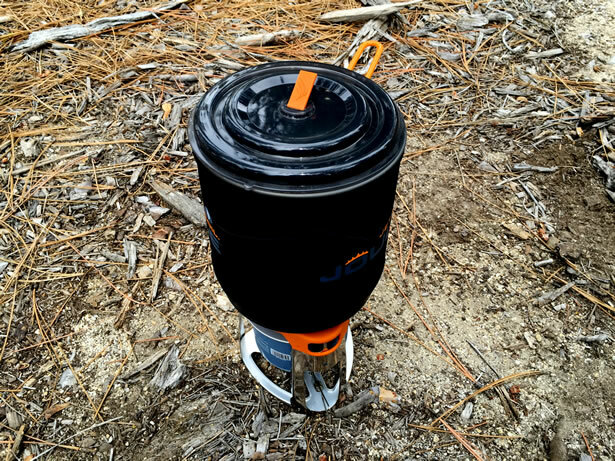 At its core, the Jetboil Joule is a large integrated fuel canister cooking system designed to accommodate large family-sized groups in the backcountry at most any altitude or temperature. The entire cook system weighs a total of 27 ounces (not including the weight of the fuel canister), but everything nests neatly within itself for efficient space-saving storage, taking no more than 175 cubic inches worth of real estate in your pack. 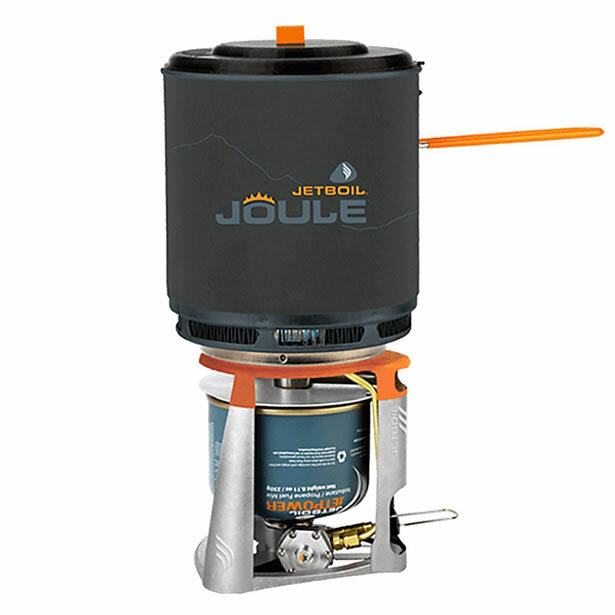 The Jetboil Joule has a unique and innovative design consisting of two key parts, a stove base and a 2.5-liter pot. When they are securely connected to each other, they become a single cook tower via two twist-lock tabs so it is quick and easy to assemble and disassemble as needed. When not in use, the stove neatly fits inside the 2.5-liter pot with plenty of room to store a single fuel canister. The stove’s base is basically the heart of the Joule cook system. It consists of a high-volume inverted liquid-feed canister stove and regulator, the pot stand and the frame that holds the entire cook system together. The base is made from a combination of steels, aluminum and plastic so it is not only very stable, it is also incredibly durable and lightweight. A high-volume inverted liquid-feed canister cooking system… Try saying that three times really fast. So what is a high-volume inverted liquid-feed canister cooking system exactly? Well… To answer that question in a meaningful way, we must first understand a little bit about the fuel used in compressed gas stoves like this one. The fuel is usually a high-performance blend of propane and isobutane, but propane and butane blends are not all that uncommon. Propane provides a higher vapor pressure for better performance in lower temperatures, and isobutane helps to provide a constant working pressure as the fuel level in the canister declines. As long as the canister remains pressurized, the bulk of the mixture will be held in a liquid form with only a small amount still in its gaseous form filling up the free space. Most vendors sell clean-burning multi-season blends designed to provide superior performance and maximum efficiency in any weather condition. The fuel can be found in 100g, 230g and 450g canisters, though Jetboil’s Joule is only compatible with the 100g and 230g sizes. Compressed gas stoves typically attach directly to the top of the fuel canisters, drawing the gaseous form of the fuel from the top of the canister. However, this method is not very efficient in cold weather because the pressure inside the canister must be greater than the pressure outside of the canister in order to feed a flame. As the temperature drops below freezing, the pressure inside the canister also begins to drop until it can no longer sustain a flame. 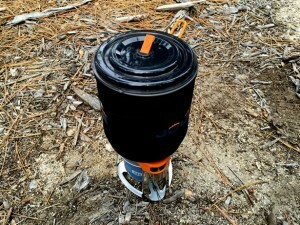 To remedy the problem, the Jetboil engineers inverted the Joule’s fuel canister so the liquid form of the fuel is sent directly into the fuel regulator, then through the delivery tube where it is preheated by the burner before being vaporized for the most efficient combustion at any altitude and temperature. This innovative design is similar to that of other types of other liquid fuel systems including those that utilize white gas. It provides as much as 10,000 BTU all the way down to 10° F (-12° C) without having to hassling with liquid fuel, o-rings and fuel pumps. The Joule features a needle valve with a folding wire handle just after the fuel regulator that provides fine-control over the flame. It also has a convenient and reliable push-button piezo-electric igniter so you don’t have to deal with batteries. It just works. 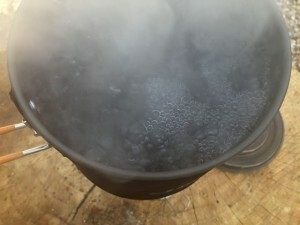 The Joule’s pot will hold as much as 3 liters if filled to the brim, but it will likely boil over if filled beyond the 2-liter mark. There are five markings stamped on the side wall of the pot, each at 1/2-liter graduations making it easy to measure a volume of water. The bottom of the pot features Jetboil’s innovative FluxRing technology which provides additional surface area around the flame to heat the pot more efficiently through convection. The pot also features a silicone-coated folding handle and a removable neoprene sleeve that surrounds the pot to help it retain heat while it is in use. It also has a durable see-thru plastic lid with an integrated strainer. However, the lid will likely melt if it is left on the pot while it is being heated. With the lid in place, the handle folds over to lock everything inside. 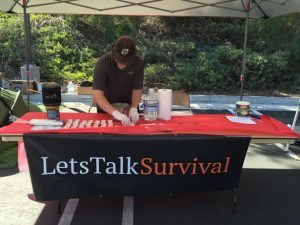 My son and I happened to be handing out some free samples of reconstituted freeze-dried food at a local Emergency Preparedness Expo not too long ago were I would be providing people with a taste of long-term survival foods. As a result, I had a few pots of food to make and hundreds of samples to give out. I thought it would be the perfect opportunity to test out the Joule. I planned to perform two standard timed boil tests. One with a single liter of water, and another with a full 2.5-liters of water. Since there wasn’t any tap water available, I used some purified drinking water that I had stored in 1-gallon containers. The ambient temperature in the shade was about 70° F, and the water temperature was a little over 65° F. With the pot fixed to the stove base, I was very impressed at how stable the platform was. The first timed test with a single liter of water went very quick, even with the valve set approximately halfway between off and full. The water reached a full rolling boil in just under 2 minutes and 45 seconds. I ran the same test two more times with a cooled pot in similar conditions and achieved the same result, give or take a few of seconds. The next test was with a full 2.5-liters of water leaving 1″ of space at the top of the pot. This time, it took just a few seconds over 7 minutes to reach a rolling boil. But I had to turn it down immediately because it began to boil over. The directions on the freeze-dried food called for me to add it to the boiling water and turn down the flame to a slow simmer for another 25-30 minutes. Once the soup reached the desired consistency, I turned the flame off and we began serving the samples. The insulated pot kept the food plenty warm while we were serving the samples. In fact, we only had to light the burner once to warm it before the food was all gone. The cleanup went quick and easy. The non-stick coating on the interior of the pot prevented any food from sticking making it very easy to clean, and the clean-burning fuel kept the exterior of the pot clean as well. Later that same day, and under similar conditions, I tried boiling a full pot a few more times just to verify the results that I had achieved at the expo. I was very surprised by the consistency of the Joule. Each of the boil times only varied by about 10 seconds or so. The Jetboil Joule is a rugged gas stove designed for families and larger groups that require more hot water. Sure it is a one-trick-pony capable of using only a single fuel source. But that pony is environmentally friendly and it is exceptionally fast and efficient. For those of you who are already fans of gas stoves and regularly stock up on the fuel canisters, this stove would be a terrific add to your survival/camping gear. The obvious issue with gas stoves like this one has to do with the fuel canisters. They are rather expensive and stocking up on the small containers requires a lot of storage space. 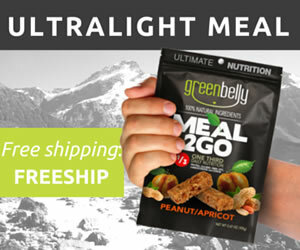 However, it is very inexpensive to refill them yourself with straight butane, though you will lose much of the efficiency that the multi-fuel blends provide in colder weather and at higher altitudes. 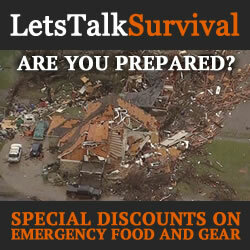 In warmer climates, this can save you loads of money. But it can be dangerous so do this at your own risk. Regardless of the cost, it is very difficult to argue with the results. The ease and efficiency of the Joule is absolutely phenomenal. It performed so well for me that if I start presenting at emergency preparedness demonstrations and expos more often, I will likely pick up a few more of them. As for my own preps, I know that my family can count on this stove provided I have enough fuel on hand. Two thumbs up!